Looks like all that work on the never-seen Sinister Six movie may pan out after all for Cabin in the Woods director Drew Goddard. Rumor has it he's meeting with Sony right now to reboot Spider-Man. 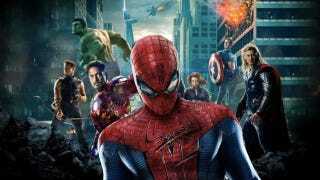 Last month Marvel and Sony announced that the web-slinger would be appearing in the Marvel Cinematic Universe and that Spider-Man would be getting a top-to-bottom reboot with a a recasting. Today, Deadline has announced that io9 favorite Drew Goddard of Cabin in the Woods and Buffy fame has been meeting as a likely candidate to script AND direct the next iteration of Spider-Man movies. Whatever that may be. Granted, the rumor is it's all just "talks" and nothing is confirmed as of yet. Latino Review has added to this that the series will be called the "Spectacular" Spider-Man after the Marvel comic run of the same name (also similar to The Amazing Spider-Man run from Mark Webb). Goddard was previously attached to the Sinister Six movie, and while that sounds like it's been scrapped (for now), we're betting most of the research he did for that film will be valuable as Sony and Marvel attempt to create new Spider-Man, WITHOUT another origin story (thank goodness).